Here is the English version of an essay I wrote for the Allgemeine Zeitung of Mainz — the birthplace of Gutenberg and of his invention. 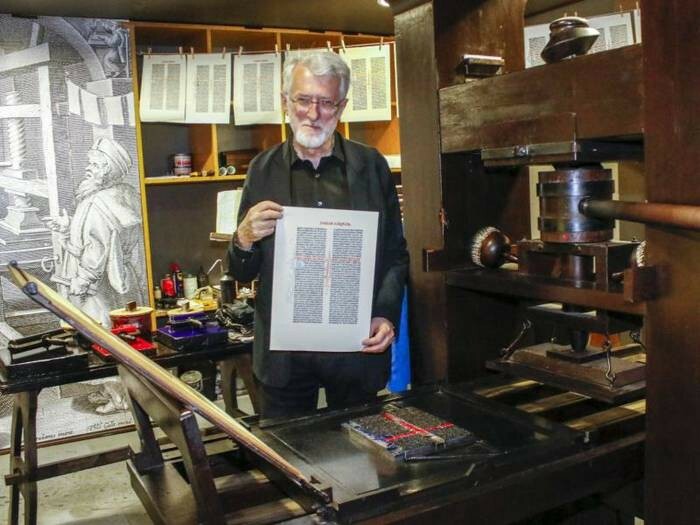 I’m honored that it was translated into German by the leading expert in Gutenberg, Prof. Stephan Füssel of Mainz University, who just produced an amazing fascimile of and commentary on the Gutenberg Bible. It is fitting that we pay tribute to Johannes Gutenberg now, as his grand invention reaches its twilight. The lovely geometry of type and the grammar of text have been overtaken by the binary aesthetics of data and dots. Today, our vulgate is visual, our vernacular video. Come the 600th anniversary of movable type, it is unlikely that words will any longer be impressed on paper mechanically, now that they can be sprayed, transmitted, copied, and animated digitally. But let us not mourn print’s passing. Let us first celebrate the example of innovation Gutenberg set. He was, perhaps, our first technology entrepreneur; Mainz was his Silicon Valley. He had to grapple with challenges similar to any startup’s today. Fundamental to the business he began — as in today’s economy — was the necessity of scale, of manufacturing fonts in large numbers so that books could in turn be manufactured with then-unimaginable speed and efficiency. He tamed many technologies: mechanics to build the ingenious, hand-held mold used to make letters with great precision; metallurgy to produce a lead amalgam that would cool quickly but withstand many impressions; chemistry to formulate the ink whose midnight blackness in his Bibles still has not faded over centuries. He designed an industrial process with division of labor. And he had to innovate new business models based on using risk capital before revenue would flow (which is how he lost much of his business to his financier, Johann Fust). The epochal impact of Gutenberg’s work will be measured for still another millenium. “Print technology created the public,” said Marshall McLuhan. “Invent the printing press and democracy is inevitable,” Thomas Carlyle is often quoted as saying. The Reformation, the Scientific Revolution, the Enlightenment, even the Industrial Revolution — could any of these fires have been lit without printing’s spark? I am not arguing for technological determinism — that printing caused these disruptions with certain outcome — but instead that printing made them more possible. The acts were still human; the tools Gutenberg’s. At the dawn of the net age, we still see the future in the analog of the past, in Gutenberg’s terms. Two Danish professors, Tom Pettitt and Lars Ole Sauerberg, argue that Gutenberg’s centuries were an exception in human history — the Gutenberg parenthesis, they call it. The book — a container — made us see in the world as packages with boundaries, with a beginning and an end. Says McLuhan: “The line, the continuum — this sentence is a prime example — became the organizing principle of life.” Thus we came to call literature and journalism “content” to fill containers: books and later newspapers. Books standardized our languages and helped define us as distinct peoples and nations with boundaries of their own. With the copyright law that followed Gutenberg by a century, books and that which filled them could be bought and sold as property. With the addition of steam power to the press, we came to measure mankind by volume: mass media, mass marketing, mass culture, mass man. Books — more abundant than ever but still a scarcity — supported the elitism of the author, the academic, the expert, and eventually the celebrity. And now we have the internet. Invent it and what is possible? It is too soon to know. Today, we are only 24 years from the introduction of the commercial web in 1994. Reckoning by Gutenberg time, that puts us at about the year 1474. Consider that Martin Luther was not born until 1483. What if our Luther — the visionary who will fully understand and exploit the greater potential of the internet — is not yet born? In the internet, we have a world in which every person can be connected to every other person and to any fact instantly. We have the opportunity to collect and build upon information as never before; now our machines can manufacture not just books but intelligence itself. Because we now communicate with images on Instagram, video on YouTube, and symbols as emoji, the definition of literacy has opened up so everyone is empowered to speak, be heard, and create a public. What becomes then of our economy of content, our notion of nations, our ideas of education, our standards of culture, our laws governing ownership of content or data, and our hierarchy of elites vs. masses? Who knows? I would like to think that we can return to the other side of Gutenberg’s parenthesis and learn once again how to hold conversations as the threads that weave a society. I would like to see us move from a society built on transactions to one built once again on interactions with ideas and facts, emotions and empathy, and each other. Can the net help us gather into communities more easily and then to build bridges among them? Can it help offer the power of education and creativity to many more people in the world? Can the internet help us recognize our connected humanity again? Today — especially in the narrative of media — it may feel like the opposite is occuring, as if we live in an age of cold, impersonal technology that is challenging our institutions, threatening our jobs, grabbing our data, spreading lies, amplifying hate. But the machines aren’t doing all that. We are. Or rather, some small number of people — trolls, thieves, demagogues, racists — have learned how to exploit weaknesses in both technology and society before the rest of us have a chance to plug the leaks in our morality. Study and learn from prior disruptions in society — starting with Gutenberg’s own — to give us perspective and inform our decisions today. Rely on evidence of actual harm before assuming the worst and acting on that fear to legislate and regulate. I am not convinced that the internet is addicting us or killing privacy or even that the fake news on it can sway elections. Nonetheless, we certainly must become smarter about recognizing and counteracting efforts to manipulate politics, markets, and lives with technology. Negotiate new norms of behavior. We have decided it would be rude to take a phone with a camera into a locker room or sauna. We are close to deciding when it is OK to pick up a phone to check messages and when it is not. A far more difficult question is how we negotiate the the balance between free speech and threatening, hateful, manipulative, or false speech. Most of all — as difficult as it might seem in this age of AfD, Trump, and Brexit — we need to regain faith in the sense and civility of our fellow man and woman. Technology alone does not corrupt the human brain and soul. Despite fears that it would, the book did not ruin civilization. The internet won’t either. We’re too smart for that.